Hello to you all - If you're a 'local' then you might be interested in this wonderful event tonight in American Fork. It will be a powerful presentation on the blessings of freedom and at what cost they have been bought. I believe that this will be an event to help all ages understand the great sacrifices of others' in their behalf. 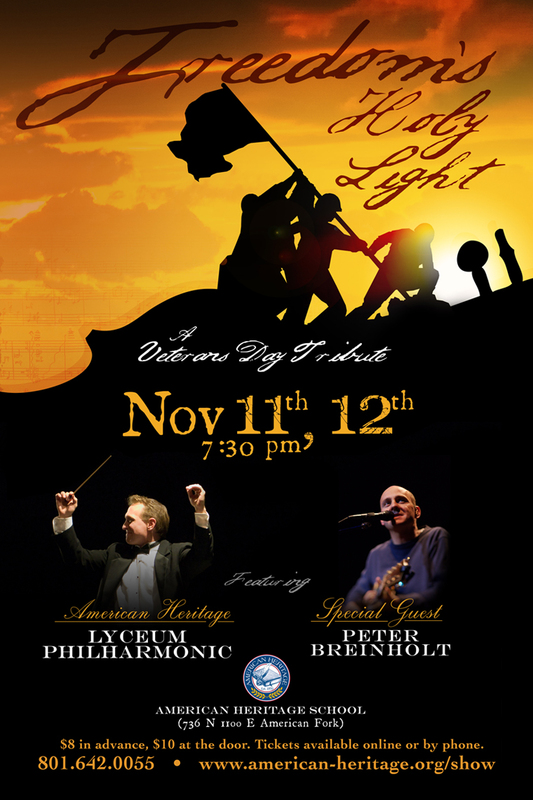 Special tribute "Freedom's Holy Light" to honor veteran's and their families this Friday and Saturday, November 11 and 12, featuring special musical guest Peter Breinholt and the American Heritage Lyceum Philharmonic. This will be a truly amazing production, featuring stories and pictures of veterans from various wars, powerful music and original orchestration, special guest narrators Marvin Payne (Friday) and Senator Mike Lee (Saturday), and families of veterans from across the Wasatch Front.